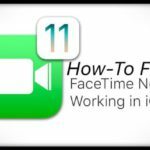 We will explore some of the basics around setting up this new subscription as well as highlight workarounds and other tips that should help you overcome some initial challenges, if any. We have also added a section focussed on information for existing Texture subscribers. 3 Unable to get Apple News+ on device? 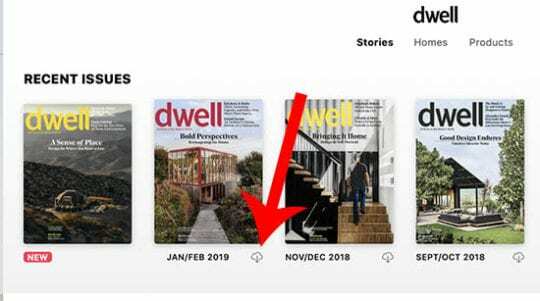 7 How can I delete downloaded magazines in Apple News+? 8 Cannot Access Apple News+ on another Apple device ? 13.5 What about newspapers and digital subscriptions? 16 What happens to my Texture subscription? Tap on ‘Try it for free’ to get started. Confirm signup for Apple News plus. Several users have reported challenges while trying to access and setting up Apple News+. Some users have been able to sign up for the Apple News+ service only to see the message that they have subscribed. For whatever reason, they are unable to access the content on their Apple devices. Unable to use Apple News+ service. Other users were successful in signing up for Apple News+ but then it just takes them back to the ‘Try it for Free’ page all over again. 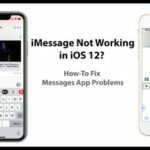 This article provides you with some tips and workarounds to manage some of these issues associated with Apple News + service. We tested the subscription service without any issues. The only issue that we found while testing was the ‘Purchasing…’ loop on the iPhone that we have discussed below. Unable to get Apple News+ on device? Enable Apple News in restrictions. Make sure you are not behind a VPN. Disable any in-use VPN services on your iPhone or iPad and then try. Try another Wi-Fi Network or switch off Wi-Fi and just use Cellular and then check and see if it works. Sign out of your Apple ID, restart your device and sign back in again and then try and subscribe to the Apple News + service. If all fails, delete the Apple News app from your device and re-install it from the AppStore and then try again. For some users (including us), the process simply hangs at the ‘Purchasing…’ screen. 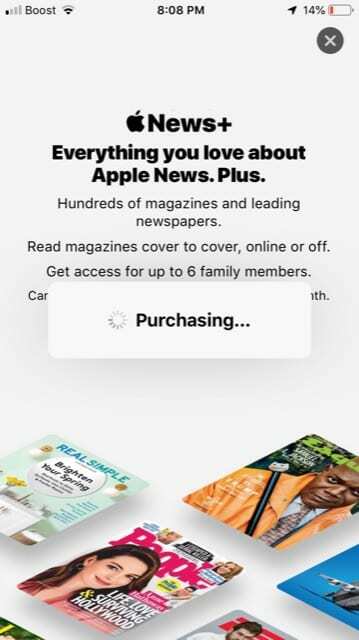 If you are getting stuck on this screen, exit out of the app and then restart Apple News app, tap on News + Tab at the middle of the screen and you should be able to access the News + content on your iPhone. 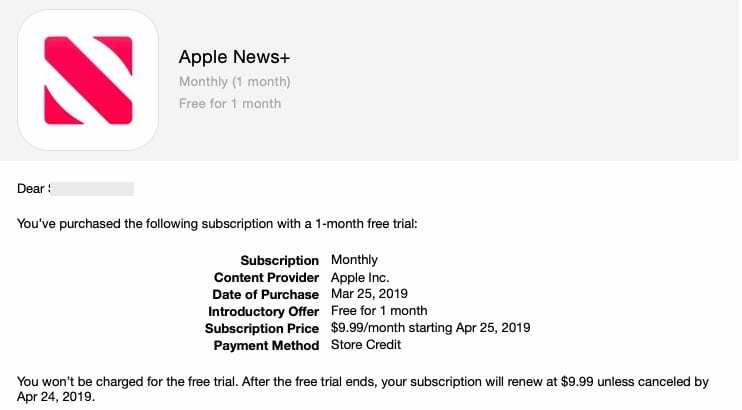 You should also see an email from Apple in your inbox confirming that you have signed up for the Apple News+ subscription. Apple news plus confirmation email. This is less of a problem and more of a semantics issue. There is a big difference between downloading a magazine and following a magazine in Apple News +. Magazines that you choose to ‘follow’ will only show up under the ‘My Magazine’ section. You can download magazines without following but these titles will not show up under the ‘My Magazine’ section. 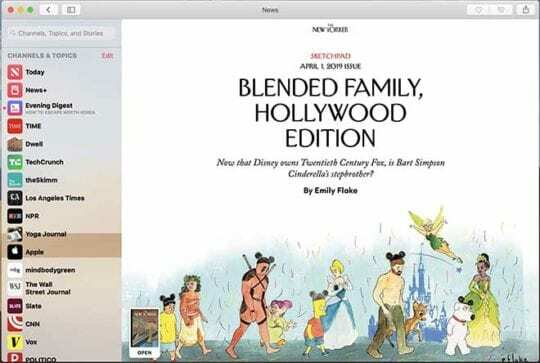 Setting up the family sharing feature for Apple News + has also had its fair share of challenges for some users. You need to make sure that you have enabled purchase sharing for this to work. The Organizer has to enable Purchase Sharing in order for members to be able to use News+. How can I delete downloaded magazines in Apple News+? “You can’t delete an issue that you download to your device. New issues of magazines that you follow automatically download to your iOS device when you’re connected to Wi-Fi (and have enough storage space). Automatically downloaded issues delete themselves after 30 days or sooner if storage space is limited. 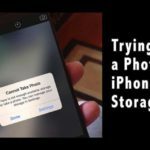 If your device has limited storage capabilities, you may want to rethink before you start downloading multiple magazines manually into your iPhone or iPad. Cannot Access Apple News+ on another Apple device ? 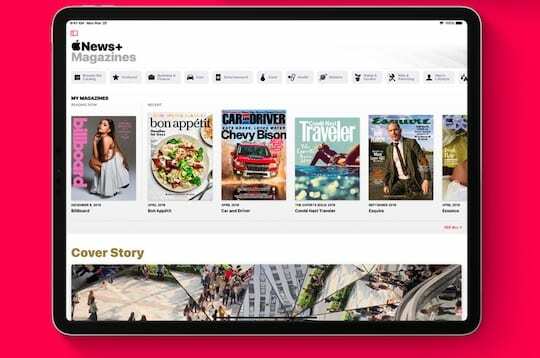 We have seen reports of some users struggling to get the Apple News + content on all their Apple devices once they have subscribed to it using one device. If you subscribed using your iPhone and are not able to access the service on your iPad, you are not alone. There are other users who are experiencing similar problem. This is probably a bug in the software. One workaround that seems to be working for some users is to unsubscribe using the iPhone and then re-subscribe using your iPad. 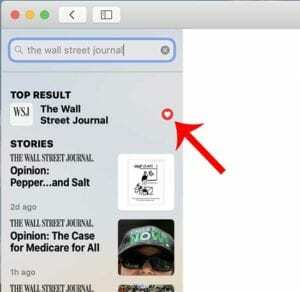 When you do this, you will be able to access Apple News + on the iPad as well as the iPhone. 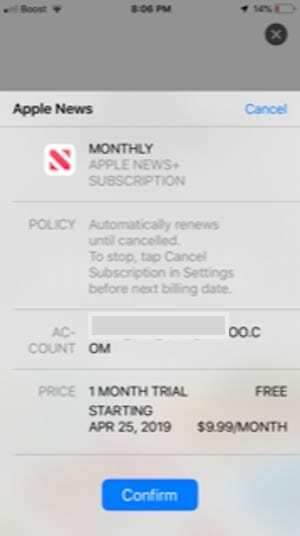 The section above suggests to unsubscribe and then re-subscribe from Apple News + service in order to get it working on another Apple device under your Apple id. 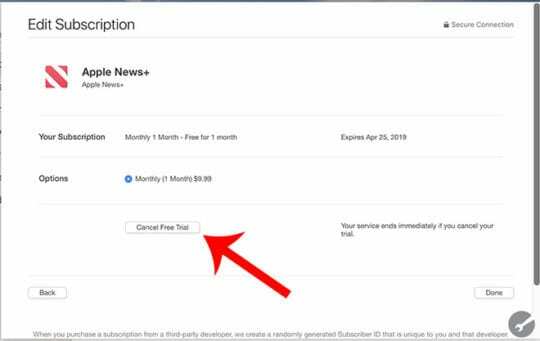 Cancel Apple News plus subscription via manage subscriptions. 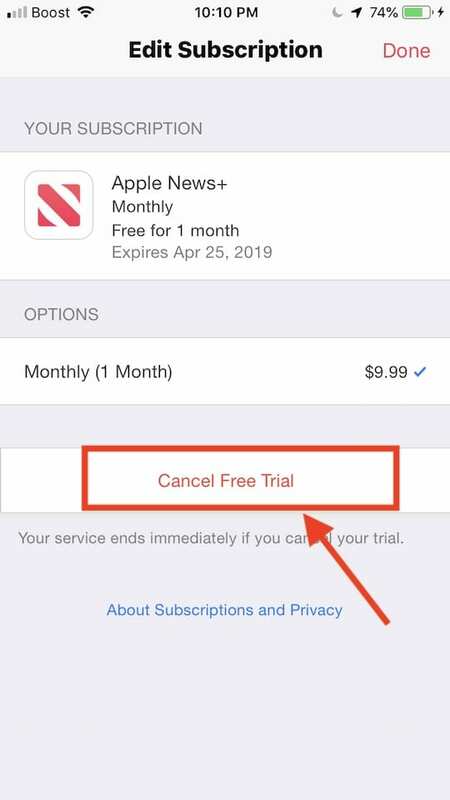 This will cancel your free Apple News+ subscription service. Some users seem to have issues with Apple News this morning. The app seems to be crashing unexpectedly. 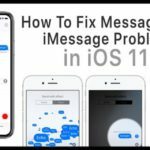 We didn’t see this issue yesterday when the new iOS 12.2 was released. Appears to be an issue on Apple’s servers and hopefully they are looking into it. 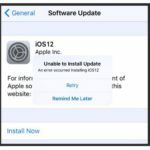 In the meantime, make sure that you have rebooted your iPhone or iPad after iOS 12.2 update to reduce the chance of crashing apps. Another workaround to the crashing issue, reported by some users is to follow these steps in sequence. Definitely a weird workaround and we haven’t tested this. Give it a try and see if it works for you. We think that the issue is on Apple’s servers and they will be fixing this problem very soon. During its announcement event, Apple spent quite a bit of time going over Apple News+ on iPhone and iPad. But it didn’t really delve into the platform on macOS. That’s okay. We’re here to help with everything you need to know about using Apple News+ on your Mac. Note: Before you can sign up for Apple News+, you’ll need to make sure you have macOS 10.14.4 installed on your system. Previous versions of the Apple News app don’t support News+. Look for the News+ category in the sidebar. Click on it. You should see a banner or subscription offer in the News+ page if you aren’t already subscribed. Click on it and follow the instructions. Keep in mind that Apple is offering a full one-month free trial to all iOS and macOS users. There’s only one trial per account, but Apple News+ will work across all of your devices. Apple News+ is an additional feature of the native Apple News app. As you may expect, you’ll access the extra content using that app. In macOS and iOS, there’s now an additional News+ category or tab that will bring users to the Apple News+ home page. If you aren’t a subscriber, this tab will only encourage you to sign up. The Apple News+ home page. When you’re first brought to the Apple News+ page within the standard app, you’ll see a similar screen to what’s available on iOS. At the top will be a selection of categories and a My Magazines area, but we’ll get to these two later. Scrolling down, you’ll see home human-curated picks, as well as content from different sections. At the time of writing, there was a parenting section, a financial section, and a section dedicated to The Wall Street Journal. Magazines in Apple News+ are organized by category. Back to the top of the Apple News+ home screen. You will see these small blocks broken down by category. Besides the home page curation, these blocks are largely how you’ll find magazines to follow. Just click on any particular category — they range from news & politics to style & beauty. You can also click on either Browse the Category buttons to view all of the available magazines in alphabetical order. There’s also a featured tab that recommends some of Apple’s own picks. To start, all you need to do is click on a magazine to start reading it. Some magazines will feature exclusive Apple News formatting, while others will be simple PDF documents. The Apple News formatted magazines are extremely simple to navigate on macOS, so we’ll refrain from going too in-depth. You can flip through them, or scroll down from the cover to see a table of contents. On PDF magazines, however, you won’t find many navigation options except the ability to flip forward or flip back using a trackpad. In the corner of the PDF, you should see a small version of the cover which will open an expanded view with each page, however. You can download magazines for offline reading using this icon. You’ll probably notice that there’s a small cloud download icon next to most magazines in the Apple News+ section. Just click on any of these icons and that particular issue of the magazine will be downloaded to your device for offline reading. What about newspapers and digital subscriptions? Newspapers are digital subscriptions won’t show up in Apple News+; you’ll need to search for them manually. If you spend any time in the Apple News+ section, you may find that there are a few things missing from the categories at the top. Namely, you won’t find newspapers like the Wall Street Journal or digital subscriptions like theSkimm in the Apple News+ interface. Instead, you’ll need to manually search these publications and outlets out using the Search bar. With an Apple News+ subscription, you’ll have access to them. But even if you “heart” them, they won’t appear in the Apple News+ section. Just something to keep in mind. We’ve saved the My Magazine section for last because it is, unfortunately, the most confusing. The first magazine that pops up, under the Reading Now subheading, is just the last magazine that you opened in Apple News+. That’s pretty simple. But the magazines under the Recent subheading, you’ll see two things: magazines that you actively follow and magazines that you’ve recently read. To add a magazine to My Magazines, search for it and click the Heart icon. To formally follow a magazine, you’ll search for that magazine using the search bar. Just click the heart icon next to the publication. To unfollow it, uncheck the heart icon. There doesn’t appear to be a way to add or remove magazines to and from My Magazines using the Apple News+ interface (including the category tabs). Also, you’ll sometimes see magazines that you’ve recently read but didn’t follow appear under Recent. They’ll prompt disappear, which is confusing. Put simply, it’s not entirely clear how the My Magazines section works at this point. But that’s likely something Apple will rectify or at least clear up in the future. Of course, this is definitely something that Apple may address as users submit feedback. So go ahead and do that, if you feel inclined. When it comes time to deactivate Apple News+, the process is (luckily) fairly simple. Find and select Manage Subscriptions. This will bring up the Mac App Store subscription menu. Click Edit next to the Apple News+ icon. Finally, you’ll want to click on Cancel Free Trial or Cancel Subscription. Keep in mind that you may want to refrain from canceling your one-month free trial before it’s up. As soon as you hit Cancel Free Trial, your trial will expire (it won’t stop during the auto-renew period). Because of that, it may be worth setting up a calendar event to remind you to cancel right before it would otherwise expire. 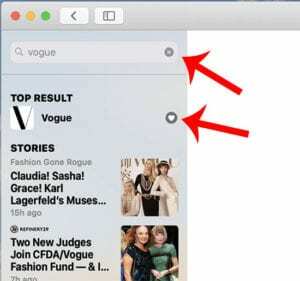 After updating to the latest macOS Mojave, some users find that the Apple News App keeps crashing on their MacBook. This happens for some users when they are in the middle of exploring some of the publications in Apple News +. If this is happening on your MacBook, make sure that you have adequate storage on your MacBook before you start downloading large number of magazines from the store for offline reading etc. If your Mac has adequate storage and you are still having the issue, you can try and reset the ‘com.apple.news‘ file. Follow the steps below to reset this container file. 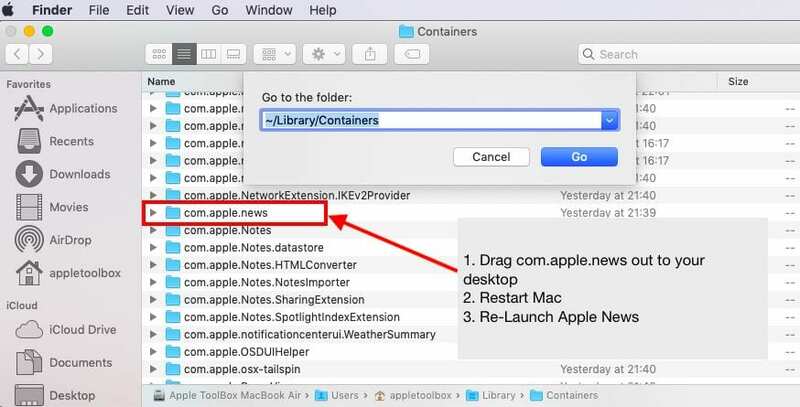 Remove Apple News container file and relaunch. Click on Go and then Go To Folder.. If Apple news works without issues after the above steps, you can discard the old com.apple.news file to Trash. Updating to iOS 12.2 disables Apple Pay momentarily for some users. Your cards disappear with an error message. If you encounter this issue, you will need to turn off Apple Pay cash and then restart your iPhone. The workaround seems to be working for several users. What happens to my Texture subscription? Apple and Texture have jointly announced that they will be closing Texture on May 28′ 2019. This announcement came following Apple’s release of its new Apple + News subscription service. Current Texture subscribers will be offered a one-month free trial to Apple News+ to make the jump once Apple shuts down the Texture app. This also means that if you were an Android user using the Texture App, you are out of luck! 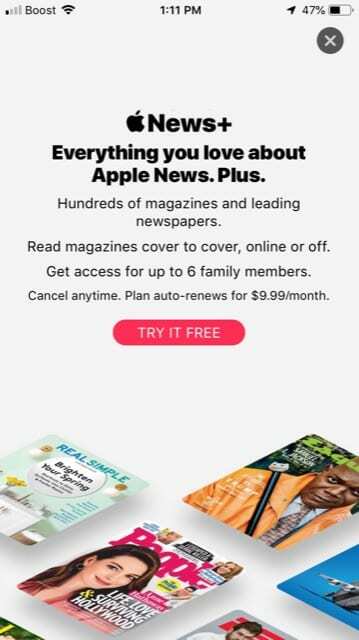 You can only avail the new Apple + News subscription on an iOS device or macOS machine. The new subscription service was launched today. 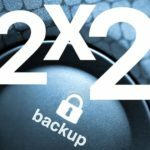 Many users may be trying to sign-up for the service at the same time leading to some of these issues. You can wait for a day or so and then try again and see if you have better luck. Apple is pretty responsive when it comes to these type of sign-up issues. 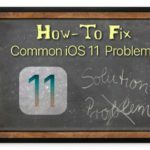 If this is a problem impacting a large number of users, we are sure that they will release a follow up iOS with bug fixes. 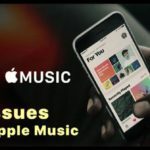 Apple Support is a terrific resource and you can reach out to them and request their assistance when faced with issues around the News + subscription service. I keep receiving a Restrictions Enabled. Certain apps, features, or services can’t be seen or used when restrictions are on. To use this app, turn restrictions off. Try turning off Screen Time completely and see if this message goes away. 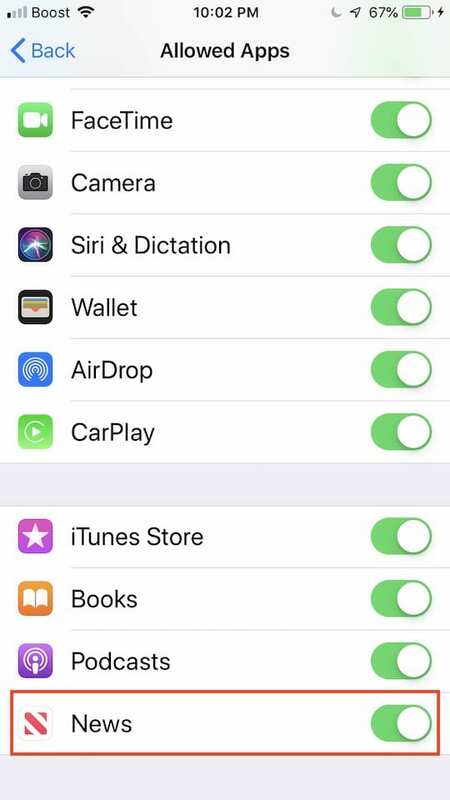 Go to Settings > Screen Time and tap Turn Off Screen Time. Thank You Alan. Good catch. Much appreciated.